PUMPKINS AGAINST POVERTY is our latest resource for Key Stage 2 pupils (aged 7-11 years). It offers great cross curricular opportunities for pupils to explore the difference that growing pumpkins can make to the lives of people living in flood affected regions in Bangladesh. Geography and Global citizenship tasks exploring Bangladesh and ways to address poverty. All the materials including a PowerPoint presentation, teacher's notes, pupil activity sheets, a poster and links to images are free to download below. To order your free A2 poster(s) to support the activities, click here. An outline of the Pumpkins Against Poverty activities, with suggestions for timings and extension ideas. All the pupil activity sheets needed to deliver Pumpkins Against Poverty in a single file. A research activity to support pupils to find out more about Bangladesh and its people. An activity to match different nutrients with information and pictures about them. A practical investigation to explore factors that influence pumpkin seed germination. A delicious recipe from a pumpkin grower in Bangladesh with suggestions to develop their own pumpkin recipes. A presentation to help teachers introduce the context and Pumpkins Against Poverty activities. A photograph based activity to introduce the impact of flooding in Bangladesh. A small group activity for pupils to rank factors in order of the importance to farmers in Bangladesh. A maths activity focusing on coordinates and calculations linked to the project. An activity to design and make a packet to keep their dried pumpkin seeds safe. To download a great set of photographs from our work on Pumpkins Against Poverty go to Flickr. Design Sparks has kindly produced a 3D artfile for schools to print their own Pumpkin Lanterns. Link to Design Sparks site. 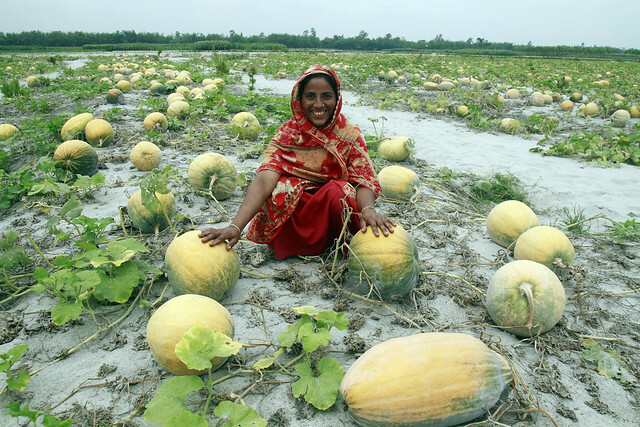 For more detailed information on Practical Action's work in Bangladesh on growing pumpkins. Please have a look at Turning compost into food.